As a participant of Rip Current Awareness Week, North Carolina Sea Grant is pleased to share this news release from NOAA’s National Weather Service. To learn more about rip current safety, please visit our Rip Currents page and ripcurrents.noaa.gov. To keep you and your family safe from rip currents this summer, click on this poster to print and use the tips while in the water. North Carolina and South Carolina will observe Rip Current Awareness Week, June 5 to June 11, 2016. Rip current and beach safety information will be sent through U.S. National Weather Service Wilmington, N.C., social media platforms, including Facebook and Twitter during the week, as well as headlined on the office’s website. This annual event gives residents of the Carolinas the opportunity to learn more about rip currents and other hazards that can occur at the beaches, especially during the highly populated summer season. Rip current fatalities rank amongst the top of fatalities across the Carolinas. On Monday, June 6, 2016 from 10 AM to 12 PM, you are invited to Wrightsville Beach, N.C., at the Johnnie Mercer Pier access to take pictures, obtain b-roll, and interview NWS meteorologist, local ocean rescue and North Carolina Sea Grant representatives, as well as learn more about rip current research and forecasting and beach safety. That afternoon, June 6, from 12:30 PM to 1:30 PM, you are invited to Fort Fisher State Recreation Area. As the N.C. State Parks system is celebrating its 100th anniversary, NC Sea Grant and NWS Wilmington will mark the occasion by presenting a new bilingual sign that informs beachgoers how to spot a rip current and how to escape — by swimming parallel to the shore. Sea Grant, NWS and parks officials will be available for interviews. 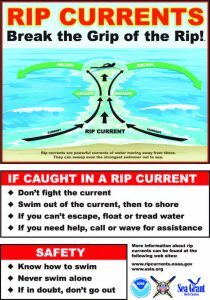 On Tuesday, June 7, 2016 from 10 AM to 12 PM, you are also invited to North Myrtle Beach, S.C., at the Main Street beach access to take pictures, obtain b-roll, and interview NWS meteorologist and local ocean rescue representatives, as well as learn more about rip current and beach information and safety. Please let Sandy LaCorte (Sandy.LaCorte@noaa.gov) know if you would like to attend any of these events.